· The occurrence character and behavior of a plant are thus an indicator of the combined effects of all the factors prevailing in a habitat. · Since a plant species or plant community acts as a measure of environmental conditions, it is referred to as biological indicator or bio-indicator or phyto- indicator. · In other words plants which indicate some very specific conditions of the environment are called plant indicator or indicator species. · The knowledge of the relationship between plants and ecological factors can be used as an indicator of the environment. · Many plants are used as indicators of the environment. · Individual plants or plant communities are used to determine the type of soil and other conditions of the environment. · Sometimes these are also indicated past or future conditions of the environment. · Plant indicators are helpful to determine local soil, optimum use of land resources for forest, pasture and agricultural crops. 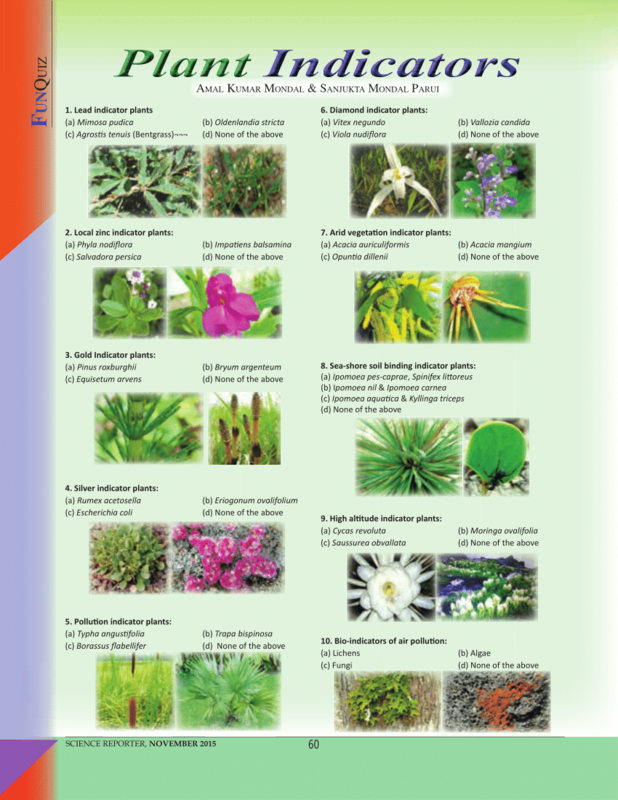 · Many plants indicate the presence of particular mineral or metal. § On the basis of the distribution of the indicators may be “STENO” species or “EURY” species. The steno species is used to indicate narrow limits of tolerance and “Eury” is used to indicate wide limits of tolerance e.g. A plant may be an indicator of wide limits of tolerance for heat but of narrow limits of tolerance for water. § Plants with wide limits of tolerance of heat are called EURY THERMAL and those with narrow limits of tolerance for water are called STENO HYDRIC. § Plants of large species are a better indicator than the plants of small species. § Before relying on single species or group of species as indicators, there should be abundant field evidence. § Numerical relationship between species, population, and whole communities often provide more reliable indicators than single species. 1. Plant indicators for Agriculture. 2. Plant indicators for Ground Water. 3. Plant indicator for Overgrazing. 4. Plant indicators for Forests. 5. Plant indicators for Humus. 6. Plant indicator for Moisture. 7. Plant indicator for Soil Types. 8. Plant indicator for Soil Reaction. 9. Plant indicator for mineral. 11. Indicator of petroleum deposits. 12. Plant indicator for Pollution. § Many plants indicators decide whether the soil is suitable for agriculture or not e.g. Growth of short grasses indicates that soil is fertile and is also suitable for agriculture. High calcium and boron, good soil suitable for crop plants. Good soil for crop plants provided irrigation is there. § Many plants are overgrazed which result in modification of grassland. § Some plants which are vigorous and undisturbed remain viable and become distinct from rest of the plants. § The predominance of annual weeds and short-lived impalatable perennials indicate sever grazing e.g. polygonum and verbena. § Some plants are less pronounced and show poor or no overgrazing. e.g. Opuntia, Grindelia, Vernonia etc. § Some plants indicate the characteristics type of forests and they grow in an area which is not disturbed e.g. i. Viola species in the western Himalayas is a suitable indicator for plantation of Cedrus deodara and Pinus wallichiana. ii. Quercus stellata and Q. mariandica grow on upland, lowland or on the sterile sandy soil. iii. Sometimes forest is destroyed due to fire, overgrazing and other environmental factors and the area are left to reach up to CLIMAX. In this subdominant species get favorable chances for growth and survival. This indicates the future plants to come and establish. § Some plants act as humus indicators. § Monotropa, Neottia, and Mushrooms indicate the presence of high humus or little which prevents regeneration of tree species. § Plants which prefer to grow in Arid areas indicate the poor or very low moisture content in the soil e.g. § Some plants grow in low soil moisture e.g. iii. Species found in the area of deep water-table e.g. iv. Species growing in water-logged soil e.g. v. Species growing in swampy conditions e.g. vi. Mangrove vegetation and polygonum are found in water-logged saline soil. § Many plants indicate the characteristics soils e.g. iv. Cotton prefers to grow in Black soil. § Many plants indicate whether the soil is Acidic or Basic e.g. i. Pinus roxburgii is calcium loving. iii. Rhododendron indicates Acacia soils. iv. Some mosses e.g. Tarantula and Neckera grow limestones. v. Halophytes such as Tamarix ariculata grow in salty soil. § Many plants indicate the presence of characteristic minerals in the soils. These plants are called METALLOCOLES OR METALLOPHYTES. Vallozia candida grows in presence of diamond in Brazil. Indicate the presence of gold minerals in the soil. Eriogonium ovalifolium indicates the presence of silver minerals in soil in U.S.A.
Stellaria setacea grows in Spain in mercury rich soil. Astragalus species grows in USA in uranium rich soil. – Gypsophila patrini in USSR. grow in the soil rich in copper. grow in Scotland in the soil rich in iron. Ulex equifolim grows in Italy in soil rich in Aluminum. Artiplex grow in soils rich in sulphur minerals. § Some plants are well adapted to grow in burnt and highly disturbed areas. e.g. § Some protozoans as fusilinds indicate peteroleum deposits in the area. § In general plants are more sensitive to pollutants than human. § Therefore, plants can be used for the Bio indication of environmental pollution. § Sensitive species can serve as indicators and resistant species as accumulators which collect a large number of pollutants without damage. § Mosses, lichens and some fungi are much sensitive to SO2 and halides. Even 1% SO2 concentration is harmful to higher plants. Lichens do no survive in areas exposed to SO2 for long time. § Many chemicals, fertilizers, pesticides and fossil fuels release toxic substances into the environmental that are taken by the plants from air, water and soil. § Atmospheric pollutants, particularly SO2, halides (HF, Hcl), ozone and peroxi-actyl-nitrate (PAN) produced from Automobiles, Industrial fumes and strong Radiations are dangerous to plants. § Harmful substances that reach plant through the air are SO2, Nitrogen oxides, Hydro Carbons, Dust and Smoke. § Plants growing in water are severely affected by toxic chemicals like Cyanide, Chlorine, Hydro chlorate, Phenols, Benzyl derivatives and heavy metal compounds of sewage. § The effects of different kinds of pollution can be determined by the nature of pollutants, their concentrations and the period of exposure. § Under exposure to high concentration plants suffer acute injury with externally visible symptoms such as chlorosis, discoloration, Necrosis and death of entire plant. § Pollution damage cane recognised by the accumulation of toxic material reduced or increased activity of certain enzymes, increase in compounds with SH groups and phenols, lowered ascorbic acid in the leaves, depression of photosynthesis, stimulation of respiration, low dry matter production, changes in permeability, disturbances in water balance reduced fertility under prolonged exposure. § Plants show reduced productivity and yield quality is also lowered. § The structure of wood is changed, branches dry out and gradually the tree die. § Seed germination has been used by many researchers/workers to monitor pollution responses. § Some plant species are good indicators of pollution. § Stunting of corn, sweet potato and Rye has bee reported due to high toxity. § Reduction in root length, short length, numbers of tillers, leaves, ears and grains in wheat have been reported under condition of cement dust pollution. § Similarly plant height, number of leaves and bolls per plant are reduced in cotton exposed to particulate pollution. § Inhibition of lateral growth of forest trees is caused by lime stone dust. § Pine trees do not flourish in SO2 pollulated area. § It has been noticed that leaf is the most sensitive organ to pollution. Red or Brown spots or streaks on the upper surface of the leaves, in the presence of more pollution leaf margins are curled, wilting of the apical part of pine needles occurs. Light spots on the margin or near the veins, the killing of tissues. Tissues of apical part and margin of leaves are destroyed. ← Light Factors and its Importance in The Ecological Field.